As you have no doubt heard, we are in a serious situation in south Louisiana regarding the weather. Torrential rains for the past few days have caused unprecedented flooding. My family is okay. Our place in Baton Rouge is on high ground, so no problems, and my mom up in West Feliciana is also okay. But I can’t get to her because broad, gentle Thompson Creek has become a raging torrent. The churning water is threatening to overtake the bridge, and has already covered the low-lying approaches on either side of the bridge, rendering Highway 61 impassable. I don’t think this has happened in living memory, not even after hurricanes. I’m really blessed because the only real hassle I’ve had from the weather is the fact that my smartphone goes off at all hours with BOOOOMP BOOOOMP BOOOOMP alerts from the National Weather Service. The last one came at 2:30 this morning. Hard to get back to sleep after that. But these things are important. My cousin and her husband out in Livingston Parish had to sleep in their car last night so they could escape if necessary. They will be staying with my mom tonight, and for as long as they need to. It’s crazy. Places that have never flooded, at least in anyone’s memory, are flooding now. But hey, I’m not panicking about that. I’m panicking about the fact that I was sitting in my living room working on the Work chapter of The Benedict Option — the final chapter — when suddenly my computer sort of froze, and the text of my open files began to go crazy, my words being replaced by gibberish. “Matthew, what’s happening? !” I said to my teenage son Matthew, who is tech-savvy. I shut the computer down at once. I was so panicked that I just shut down, and went to bed. Got up early this morning, drank my coffee, put on my raincoat, and drove to the Apple store to try to beg my way onto the Genius Bar list without a reservation. When I got there, the store was dark, and there was a man in the back wearing galoshes. He came to the front, opened the door, said he was the manager. So, here I sit, stewing in a toxic flood of panic, waiting for Monday, and unable to do a thing with the manuscript, because it’s all on a laptop that I’m praying will not completely die before the surgeons can get their hands on it. The good news is that the entire second draft has been for a couple of weeks in the hands of my editor. Plus, I’ve been saving things all along on a flash drive. I started working on the new chapter a couple of weeks ago, after my editor decided (rightly) that we needed an extra one on Work. But because we were in the process of moving, I didn’t think to save it to the flash drive. Besides, there’s no way a computer’s hard drive would crash at the most inopportune moment imaginable, right? Right? The Apple manager said there’s a decent chance they can recover the data, but if they can’t, all I will have lost is one chapter. That’s not nothing. I worked hard to get it right, and it was close to being finished. Still, it could have been much, much worse. Fortunately, all the interviews I did for that chapter were via e-mail, which for me is in the cloud, and recoverable — though that will be a massive pain in the rear end. Let me tell you writers now: don’t ever, ever, ever fail to save your work in the cloud. I have a Dropbox account but didn’t use it. That will never happen again. Let me also tell you something cool. Last night, I had anxiety dreams. In my dream, I was in Alaska, of all places, trying hard to work on my manuscript, but I was unable to do it. I found myself in a bookstore attached to a church, and was going through the shelves looking at volumes by G.K. Chesterton. I’m not really a reader of Chesterton, but I was amazed because here were slim Chesterton volumes that had never been published. I couldn’t believe it. I wanted to open them and read them, but every time I would try to read one, somebody would interrupt me. At some point, there was GKC himself, standing next to me, wearing a three-piece gray tweed suit. He was looking at me, but saying nothing. It was as if he were there to help me get his books open. I can’t remember how that ended. @roddreher Grande. Chesterton will surely help you! I was asleep when Marco tweeted that, so I couldn’t have seen it before going to bed. Hey, you never know. Mystery! I am going to read some Chesterton today, while I have nothing to do but sit and stew. Headed to the library now. Posted in Benedict Option. Tagged Benedict Option, G.K. Chesterton. Rod, maybe someone has already suggested this, but one of my favorite books to read whenever I start feeling depressed or in a panic is G.K.C.’s “Man Alive”. It’s one of the most joy filled books I’ve ever picked up. I’ve always thought that a clip from ‘bad a__ mall cop’ would make a great “edgy” advert for an online backup service*. Anyhow, good luck down there. Starhill is a hill, right? *This whole ‘the cloud’ thing is just marketing hype. Anyone using telnet to log into a mainframe has been using ‘the cloud’. Anyone using web based email, or actually just email, has been using ‘the cloud’. Yeah, Leo Laporte is a total flaming white winger. Everything is political with you folks. Everything. Ah for the good really old days of my Smith and Wesson, er, Smith-Corona manual typewriter. The worst thing that ever went wrong with it was one time the carriage return got stuck and a little tap with a hammer fixed it. Growing up in Pittsburgh and being a witness to such things, I’ll double that bet and say that there’s no way they would have cleaned up after themselves either. Externalizing environmental costs is all fun and games until your fish start growing a third eye. Thank you so much for checking in on me. My house stayed dry but some folks down the road were less fortunate. So glad you are ok, too. I never put anything in The Cloud. Why not? Two words: Edward Snowden. No, not even that bad… don’t want the commerce boys to have access. Anything that has a password can be hacked. I keep it on an internal hard drive, a flash drive, and an exterior hard drive. Most of my writing is on a laptop that doesn’t even have an internet connection. It has some old dial up email software, which works fine for text. I appreciate where you’re coming from, but I’d suggest that Snowden is actually not a relevant threat when it comes to your cloud account. He took advantage of his privileged position in a department without strong document controls. By comparison, companies like Google and Apple have incredibly tight security that preclude that sort of access. Your biggest risk is password strength, and if you have a strong password you don’t use anywhere else you’re going to be fine. (Provided you’re using a cloud service with decent security, and not some email server running in someone’s bathroom). Rod, let me underline the value of using Apple’s Time Machine. You’ll need an external hard drive but you’ll have versions of your documents going back hourly for the past day, daily for the past month, and weekly for anything before that. My working setup has two automatic backups (Microsoft OneDrive + Apple Time Machine) as well as a third offsite with GitHub. you can even store them on your gmail account, just create a draft email and attach the file. doesn’t the American Conservative not offer some sort of storage? seriously this is the type of work I do. identifying and protecting vital records ie records that one needs to protect. yup that is how i handle my files. I eschew the use of v1, v2 as to confusing, but I will occasionally during the day use .1, .2 after the date as in YYYMMDD.1, YYYYMMDD.2 etc. once you have your final just use YYYYMMDD_Final. always use underscores and not spaces to separate. also small portable flash drives are cheap these days. I purchased a 64GB flash drive at Office Depot for under $20 a few weeks back. Contrary to reader Phil, I have had a great experience with Carbonite. I never have to think about backing up, and on the two occasions I’ve needed to retrieve files, it has been a snap. Alex liking Ike takes the devious way out of accepting the obvious while denying that human activity has ANYTHING to do with it. However, he seems to be the sole authority on his remarkable assertion, as he mentions no other. I have certainly read in a number of geology and paleontology studies that the earth has had many periods when it was much warmer… and that one reason it cooled is precisely the fact that so much carbon was sequestered in the ground, in the form of coal, oil, etc. There are of course other oscillations, some of them mere tens or hundreds of thousands of years, and fairly recent. Scientists actually have fairly good tools for studying them, even without time machines, which is how Alex, and I, and anyone who cares to read, know that such ages existed. There are natural correctives, and we may actually trigger some of them, which would change the vectors, but not the disruption. Long before global warming was an issue, I recall an article about how when the waters of the Atlantic and Arctic rise above a certain sandy shallows, and mix more freely, it triggers weather patterns leading to an ice age. The movie “The Day After Tomorrow” is implausible, because it had to condense everything into a year or so of movie time and a couple of hours of watching time. I know of no scientific papers about vast tornadoes pulling cold air down from the troposphere. But, there ARE studies indicating that the last ice age formed over 100 years, not by glaciers crunching majestically southward, but by excessive snowfalls that never entirely melted in summer, and accumulated from year to year. With the cold springs, warm autumns, increased autumnal precipitation, that we are having in the midwest, I could easily imagine that this is the weak beginning of a weather pattern leaning in that direction. We’ll know more in a hundred years or so. Rich S, I was imprecise. I referred to what Snowden revealed, not what he accomplished. Ah. This is the kind of answer I’ve expected. Unfortunately, I’m not the sole authority on this. But let us be logically consistent. Aside from global warming, CO2 causes air pollution. Right? Hence, the air pollution is correlated to the level of emission. Right? 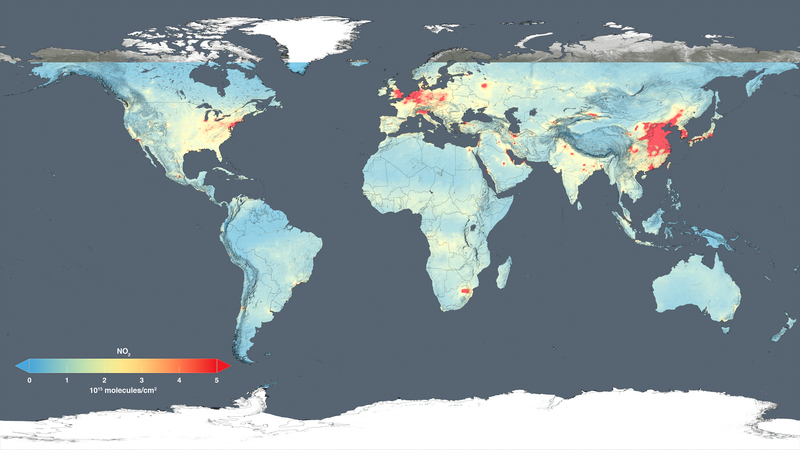 It shows that the air outside China, Germany, Southern England and a few tiny spots known as New York, Paris, Moscow, Milan, Tokyo and Yokohama metropolitan areas is almost entirely clean. Those nasty sneering British imperialists, sadistic German nazis and pink Chinese commies. Screwed the whole climate up. Post scriptum. They also stole my horse, punched my dog and spat on my cat. P. S. And killed Kenny. P. P. S. Hope Rod smiles when reading this and his mood improves. Unlike some other Trump supporters, I have no problems with Rod and other people criticizing Donald in this situation, even if I don’t agree with what they say. He’s our guy, after all, and we have the right to expect higher standards from him than from his outspoken neoliberal opponent. And such criticism may improve his political stance as well. What I can’t understand is using such a disaster as a pretext for environmental activism for further undermining the industry. No, partner, it doesn’t cause air pollution. But if you claim that CO2 is so much concerned with human activities, you automatically admit that it mostly comes from the biggest skunks. And we clearly see that there are quite few of them. So, unfortunately, I’m not the one who’s digging himself here. And that is how sham theories fail. The devil is in the details, as always. And there are yet more of those details if we look at another map, this time precisely about CO2, I’m planning to show further.